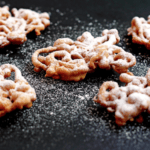 What inspired these homemade funnel cakes you ask? I am afraid of roller coasters. I never ride them and probably never will. Heat oil in a pot to about 375 degrees. Whisk together flour, sugar, baking powder, and salt in a medium sized bowl until combined. Next whisk in wet ingredients: milk, eggs and vanilla extract until the batter is nice and smooth. Add batter to a funnel, squeeze bottle or even a cake decorating piping bag with a round tip. Once oil is nice and hot, swirl batter in a spirally shape (have fun with this part) into the oil and fry. Turn over once the first side is nice and golden brown. Once both sides are golden brown, remove from oil and place on paper towels to drain. These babies fry fast! Immediately cover with confectioner's sugar or other toppings and serve while hot. If you are frying a lot, feel free to keep these warm in the oven until you are ready to serve.